A native of Ballymena in County Antrim, Geraldine Higgins joined Emory University’s English faculty in 1996. 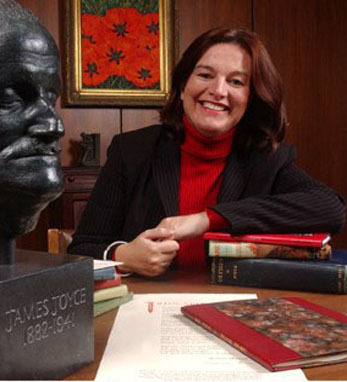 Her courses on Irish literature focusing on the themes of creativity and conflict have attracted students from across the college and converted many to Irish Studies. Higgins earned a first-class Honors degree in English and history at Trinity College, Dublin and went on to receive her doctorate in English from Trinity College, Oxford. While a graduate student at Oxford, she taught for several years with Emory’s summer British Studies program and began to foster links with Atlanta. Formalizing Irish studies at Emory was a project years in the making. In 2003, Seamus Heaney decided to place his correspondence archive at Emory. Heaney’s archive joined what he called a “dormitory” of Irish writers including W.B. Yeats and more than a dozen contemporary Irish poets. In the glow of this atmosphere, Higgins and the Irish Studies team made a presentation to the college, lobbying for the addition of Irish Studies to the curriculum. They were successful, and Higgins was named the program’s first director in 2004. Since then, she and her colleagues have organized numerous conferences, poetry readings, lectures and cultural events culminating in the 2007 visit of President Mary McAleese to Emory. In May, Higgins, who grew up Catholic in Ballymena, traveled with a group of Emory students on a “Journeys of Reconciliation” program that coincided with the visits of Queen Elizabeth II and President Obama. With her students, she met with politicians, religious leaders and former prisoners in an effort to understand the causes of the Irish conflict and its successful resolution.